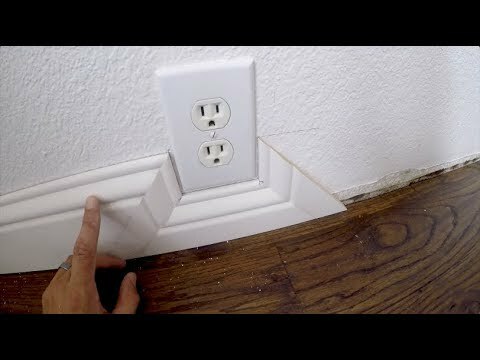 I have a situation where most of the electrical outlets are placed low--about 2 inches above the floor measured from the bottom of the outlet plate. It originally had base moldings which rose to about a third of the way up the outlet plates, but was cut badly to fit and globs of caulk was used to fill the gaps, etc. I am going to install laminate flooring and was wondering if the matching quarter round mouldings can be used to the walls without the base moldings (after finishing up the rough spots in the drywall left behind). Floor guy said it would look strange, but I've seen it looking good in a 1940s home. Is there any issues with this install? It's possible to do, but not easy. There isn't much surface area on quarter rounds. Usually there is a significant gap between the floor and the wall to allow for expansion. Usually, the quarter round is nailed to the baseboard, which is nailed to the studs. Without baseboards, the gap between the flooring and the wallboard doesn't leave much material to attach the quarter round to. Just because the previous baseboards looked bad doesn't mean your new ones have to. Since it sounds like you're pulling the old ones out, you have the opportunity to select ones that will make installation around the outlets easier or prettier. Alternatively, if all of your electrical wiring in the area comes down from the ceiling, it might be a simple matter to install new electrical boxes at an appropriate height and move the outlets up. I agree with longneck about the wall finish behind the shoe molding likely being uneven and gapped from the floor. I think I'd install period-appropriate base molding with a squared top profile and extend behind the boxes with additional woodwork. It wouldn't be difficult to fit around the outlet boxes. You'd need to install box extensions. You could also get fancy and actually fit the baseboard around the outlet. How would you add baseboard trim to an angled wall? What type of subflooring should I use for a basement? Can you use casing molding for baseboard molding? What's the best way to patch baseboard trim?